This was an interesting and unusual commission to undertake as most of my work is based on seascapes. However, having been born in Pontyberem in the heart of the Gwendraeth Valley, I can recall the strong influence the mining community had in the village from the early 50’s and 70’s. I based the painting from a collection of images I had gathered from archive material and from an old schoolfriend who happens to collect old photographs of the village and the surrounding area. Also, I do remember when I was 18 yrs of age having the opportunity to go underground at the Cynheidre Colliery (Shaft 2) and the images of that visit has remained with me ever since. 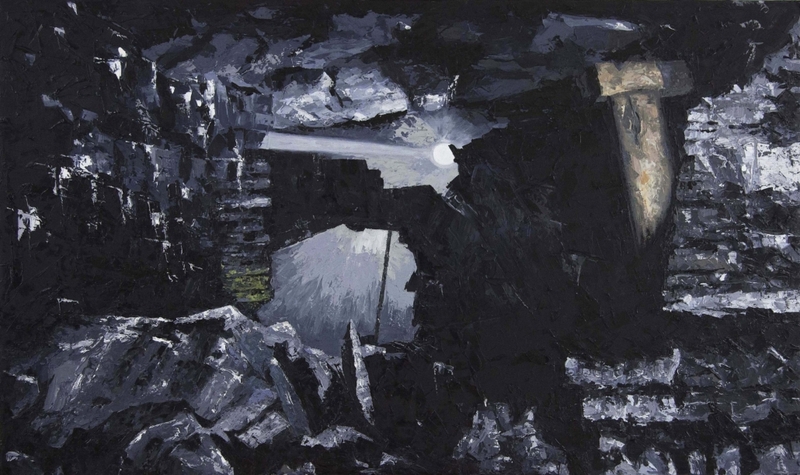 The combination of archive and memorable images of a coal mine provided the basis for this painting and in meeting the client’s brief. It was a challenge and also a great honour to produce a large format piece oil painting that both the client and myself strongly connected with.